A HUMAN PERSPECTIVE The beauty and abundance of the land was a source of wonder to early explorers of North America. One who traveled the Atlantic coast referred to the “amazing extent of uncultivated land, covered with forests, and intermixed with vast lakes and marshes.” A 17th–century French expedition described “a beautiful river, large, broad, and deep” (the Mississippi). Still others found “an unbounded prairie” (the Great Plains), “shining mountains” (the Rocky Mountains), and “an infinite number of fish” (along the Pacific coast). To the continent’s first settlers, the land was “strong and it was beautiful all around,” according to an old Native American song. The United States and Canada occupy the central and northern fourfifths of the continent of North America. Culturally, the region is known as Anglo America because both countries were colonies of Great Britain at one time and because most of the people speak English. (The southern one-fifth of the continent—Mexico—is part of Latin America.) The two countries are bound together not only by physical geography and cultural heritage, but also by strong economic and political ties. The United States and Canada extend across North America from the Atlantic Ocean on the east to the Pacific on the west, and from the Arctic Ocean on the north to the Gulf of Mexico on the south (only the United States). In total area, each ranks among the largest countries of the world. Canada ranks second, behind Russia, and the United States is third. Together, they fill oneeighth of the land surface of the earth. In addition to their huge landmass, the United States and Canada are rich in natural resources. They have fertile soils, ample supplies of water, vast forests, and large deposits of a variety of minerals. This geographic richness has for centuries attracted immigrants from around the world and has enabled both countries to develop into global economic powers. All major types of landforms are found in the United States and Canada. If you look at the map on the opposite page, you will see that both countries share many of these landforms. The most prominent are eastern and western mountain chains and enormous interior plains. A flat, coastal plain runs along the Atlantic Ocean and the Gulf of Mexico. One section, called the Atlantic Coastal Plain, begins as narrow lowland in the northeastern United States and widens as it extends southward into Florida. This area features many excellent harbors. A broader section of the plain—the Gulf Coastal Plain—stretches along the Gulf of Mexico from Florida into Texas. The Mississippi River empties into the Gulf from this region. Between these plains and the nearby Appalachian Highlands is a low plateau called the Piedmont. This area of rolling hills contains many fast-flowing rivers and streams. West of the coastal plain are the Appalachian highlands. The gently sloping Appalachian Mountains are in this region. They are one of the two major mountain chains in the United States and Canada. Both chains run north to south. The Appalachian Mountains extend some 1,600 miles from Newfoundland in Canada to Alabama. There are several mountain ranges in the Appalachian system. Among them are the Green and the Catskill mountains in the north and the Blue Ridge and the Great Smoky mountains in the south. Because the Appalachians are very old—more than 400 million years old—they have been eroded by the elements. Many peaks are only between 1,200 and 2,400 feet high. The Appalachian Trail, a scenic hiking path 2,160 miles long, spans almost the entire length of the chain. A huge expanse of mainly level land covers the interior of North America. It was flattened by huge glaciers thousands of years ago. The terrain includes lowlands, rolling hills, thousands of lakes and rivers, and some of the world’s most fertile soils. The interior lowlands are divided into three subregions: the Interior Plains, the Great Plains, and the Canadian Shield. The Interior Plains spread out from the Appalachians to about 300 miles west of the Mississippi River. They gradually rise from a few hundred feet above sea level to about 2,000 feet. To the west are the Great Plains, a largely treeless area that continues the ascent to about 4,000 feet. The Canadian Shield lies farther north. This rocky, mainly flat area covers nearly 2 million square miles around Hudson Bay. It averages 1,500 feet above sea level but reaches over 5,000 feet in Labrador. West of the plains are the massive, rugged Rocky Mountains, the other major mountain system of the United States and Canada. The Rockies are a series of ranges that extend about 3,000 miles from Alaska south to New Mexico. Because they are relatively young—about 80 million years old—the Rockies have not been eroded like the Appalachians. Many of their jagged, snow-covered peaks are more than 12,000 feet high. The Continental Divide is the line of highest points in the Rockies that marks the separation between rivers flowing eastward and westward. Between the Rockies and the Pacific Ocean is an area of mixed landforms. A series of ranges, including the Sierra Nevada and the Cascade Range, run parallel to the Pacific coastline from California to Alaska. North America’s highest peak—Mt. McKinley (also called by its Native American name, Denali)—is in Alaska, towering 20,320 feet above sea level. Major earthquakes occur near the Pacific ranges. Between these ranges and the Rockies are steep cliffs, deep canyons, and lowland desert areas called basins. Canada’s northernmost lands are islands riding the icy seas near the Arctic Circle. Three of the islands—Ellesmere, Victoria, and Baffin—are huge. In North America, only Greenland is larger. Two island chains created by volcanic activity are part of the westernmost United States. The rugged, treeless Aleutian Islands extend in an arc off the coast of Alaska. The lush, tropical Hawaiian Islands, though politically part of the United States, are not geographically part of North America. They lie in the central Pacific, about 2,400 miles to the southwest. The landforms of the United States and Canada hold a rich variety and abundance of natural resources. Both countries are leading agricultural and industrial nations because of this wealth of resources. The United States and Canada possess ample water resources. They are bounded by three oceans—Atlantic, Pacific, and Arctic. The United States is also bounded by the Gulf of Mexico. As a result, both countries have important shipping and fishing industries. Inland, large rivers and lakes serve as sources of transportation, hydroelectric power, irrigation, fresh water, and fisheries. Eight of the world’s 15 largest lakes are found in this region. Among these are the Great Lakes — Huron, Ontario, Michigan, Erie, and Superior. As you will see, these lakes and the St. Lawrence River form one of the world’s major shipping routes. The continent’s longest and busiest river system is the Mississippi-Missouri-Ohio. The Mississippi River runs almost the north-south length of the United States, from Minnesota to the Gulf of Mexico. The Mississippi’s main tributaries, the Ohio and Missouri rivers, are major rivers in their own right. Canada’s longest river is the Mackenzie River, which is part of a river system that flows across the Northwest Territories to the Arctic Ocean. One of the richest natural resources of the United States and Canada is the land itself. Both countries are large and contain some of the most fertile soils in the world. In fact, the land is so productive that North America is the world’s leading food exporter. Much of this agricultural land is found in the plains regions and in river valleys. The United States and Canada also have huge forests. About one-half of Canada is covered by woodlands, as is one-third of the United States. Canada’s forests cover more land than those of the United States, but the United States has more kinds of trees because of its more varied climate. Both countries are major producers of lumber and forest products. 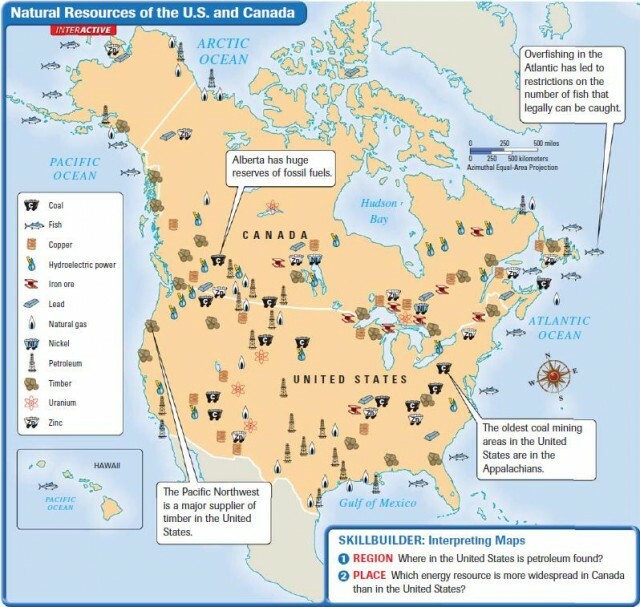 As you saw on the map on page 120, the United States and Canada have large quantities and varieties of minerals and fossil fuels. These resources gave both countries the means to industrialize rapidly. Valuable deposits of iron ore, nickel, copper, gold, and uranium are found in the Canadian Shield. Scattered among the western mountains are gold, silver, copper, and uranium. Both countries also have substantial deposits of coal, natural gas, and oil, and well-developed networks for distributing these energy-producing fossil fuels. Important coal-producing areas are the Appalachian highlands and the northern Great Plains. Significant deposits of oil and natural gas are found in the Great Plains, Alaska, and along the Gulf of Mexico. The United States is the world’s biggest consumer of energy resources. Its need for these fuels is so great that it is a major importer. In fact, most of Canada’s energy exports go to its neighbor to the south. In the next section, you will read how some landforms of the United States and Canada have affected climate and vegetation patterns.